Lock in a great price for Las Nubes de Holbox – rated 8.4 by recent guests! The location and style of the hotel were the selling point and they did not disappoint! Emily Rejun Garcia at reception was friendly, welcoming and knowledgeable!! She definitely added a plus to our stay!! I'm not a breakfast eater but people really enjoyed the food. Fruit was fresh. Bar outside was great. The island was nice, exotic and not overrun with tourists. The hotel facility was good, gave that ambience of being a bit way out from the city and off in the wild. Staff basically very helpful and kind. Food was good and they did accommodate my wife's strict nutrinional needs. The property is beautiful, rooms are nicely spacious and airy. The restaurant cooks very decent food and is a valid alternative if you don't want to go to town for dinner or lunch. Its a nice a quite place, good rooms,beautiful view, friendly and accommodating staff. Everything was perfect!! All staff is very helpfull and nice. The location is great! Very peaceful & relaxing. Will be back! Excellent hotel staff!!!! Very tasty food in the restaurant. The food in the restaurant was excellent. The staff was very attentive. The rooms were very clean, quaint and comfortable. The grounds on the property are gorgeous, you feel like you are in the middle of a tropical resort. The property was amazing and our room was huge and spacious with all amenities. The beach is the most fantastic aspect of this hotel as it literally wraps the entire hotel allowing for a magnificent view from every corner of the hotel. 3 awesome swimming pools and a gorgeous bar and wonderful restaurant. The in-house spa was also very amazing! Las Nubes de Holbox This rating is a reflection of how the property compares to the industry standard when it comes to price, facilities and services available. It's based on a self-evaluation by the property. Use this rating to help choose your stay! This boutique hotel is located on the secluded island of Isla Holbox in front of the ocean. The hotel offers ocean views, spa, ironing, paddle boats, kayacs. The rooms at Las Nubes de Holbox feature air-conditioning and a balcony. 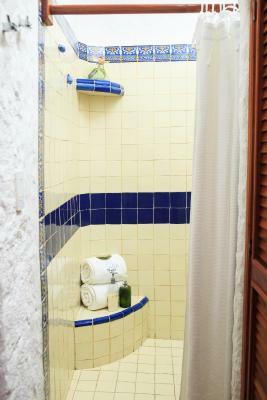 Private bathrooms with showers are also included in each accommodations. Some accommodations offers ocean views. Amenities, such as soft bathrobes, safety deposit boxes and hairdryers are also included. Guests at Las Nubes de Holbox can arrange a boat tour of the island or go snorkeling at Cabo Catoche. Massage services are offered at the Orquidea Spa. El Sabor de las Nubes restaurant at the Las Nubes de Holbox serves breakfast, lunch and dinner. Please note this property will offer christmas and new years eve dinners, with extra cost, for furhter information please do contact the property. 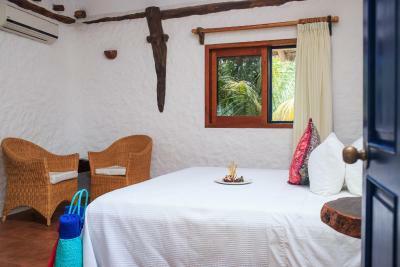 When would you like to stay at Las Nubes de Holbox? This bungalow features air conditioning, safety box, linens and blackout drapes/curtains. The private bathroom has a shower, design free toiletries and hairdryer. Massage service available. 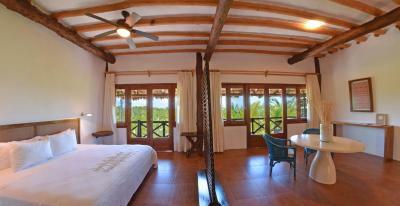 This bungalow features air conditioning, a balcony, linens and blackout drapes/curtains. The private bathroom has a shower, free toiletries and hairdryer. Massage service available. This room features air conditioning, linens and blackout drapes/curtains. The private bathroom has a shower, free toiletries and hairdryer. Massage service available. This suite features a balcony, linens and blackout drapes/curtains. The private bathroom has a shower, bathrobes, free toiletries and hairdryer. It also has free Wi-Fi, massage service available, air conditioning and a separate sitting area. House Rules Las Nubes de Holbox takes special requests – add in the next step! Up to two children under 12 years are charged USD 30 per night when using existing beds. Las Nubes de Holbox accepts these cards and reserves the right to temporarily hold an amount prior to arrival. Please note that the laundry service, the ironing service and baby sitting are not included in room rate, they have an extra charge. Water pressure was really weak and the hot water took awhile but I expected it. Instead I took quick cool showers. Sometimes I like it, sometimes I didn't. Think it was quite expensive for what you received. Breakfast included was only fruit and I think at this price level that isn't acceptable. I would have liked to stay closer to town as this is all the way at the end of the beach, so is more quiet, but that I guess is a personal preference. The rooms were spacious and very nice. Possibly a little dated in terms of design but it added a bit to the charm. Staff were very helful and friendly. There is something off, which is hard to describe. Obviously the beach is extremely shallow at this part of the island, but that's not it. Also the hotel has had its share of wear, but not to a point that is bothering. But what was bothering me was that somehow the hotel is lacking soul. Staff are sometimes great and warm-hearted, but sometimes inattentive and indifferent. Food was a bit expensive and not so good. Wonderful hotel in the most beautiful beach in Mexico. The quality of the food at the restaurant is amazing made even better by the services provided by a friendly and capable staff. The own Hotel Beach was dirty and full of seaweed. The breakfast was only fruits and coffee. For the Price we paid, it was not enough. The wifi only works at the bar or the pool and not very good.